Cairo prosecutors have ordered the detention of Egyptian TV presenter Khairy Ramadan for four days pending investigations into charges of “defaming the police apparatus”. 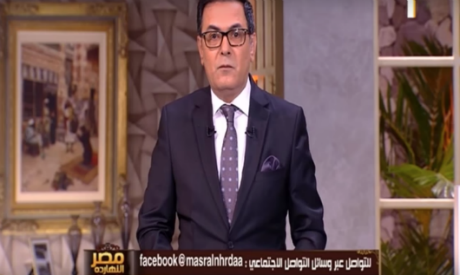 The allegations follow an episode of his show Masr El-Naharda (Egypt Today) dealing with the issue of humble police salaries. The detention order followed a complaint against Khairy filed by Egypt's interior ministry following the broadcast on Al-Oula, a state-run television channel that has recently been revamped to ragain its status as Egypt's pioneering channel. In the episode broadcast on 18 February, Ramadan said he received a message from the wife of a police colonel complaining of low police wages, which she said was an issue “faced by all police officers”. During a private meeting with Ramadan, the unidentified woman discussed the hardships faced by her household due to her husband’s low salary. Ramadan was outspoken on the issue, showing his support for the wife during the episode. This is not the first time that one of Ramadan’s nighttime broadcasts has been widely criticized for the issues discussed. In February 2016, his show Momken (It's Possible) on privately-owned channel CBC was suspended after a guest allegedly "insulted" women from Upper Egypt. The show hosted Taymour El-Sobky, the then Facebook administrator of Diary of a Suffering Man, a Facebook group with over 1 million followers, who said that Egyptian women – especially from Upper Egypt – have a tendency to cheat on their husbands.